I’ve recently embarked on an experiment to modify the Caper! rules for a superheroes game— specifically a game of superhuman private security contractors in the Marvel Cinematic Universe. Some of us in our Boston extended gaming family had played Marvel Heroic Roleplaying last summer, and sadly the rules just never really clicked for me. I liked a lot of what they were trying to accomplish thematically, and the books were absolutely gorgeous, but as a player I never quite groked all of the various mechanics for dice pool builds and Opportunities, Assets, Distinctions, Complications and whatnot. And I know Chris (who was GMing that campaign) also had some problems on his side of the table, what with the Doom Pool, the nuts & bolts of building opposition, etc. I decided that this summer was going to be the Summer of Marvel Caper! We’ve played two sessions so far, and it is going pretty well. The rules themselves are a work in progress, but what is amazing to see is when the narrative control widgets really click for a player, and when they really grok how to leverage the framing and storytelling of the various Letter mechanics and whatnot… it really takes the stories in very unexpected directions, which is really gratifying for me as a game designer, and I think for the rest of the players as well. This game, more so than any other rpg I think I’ve ever played, makes us all into an audience that can be genuinely surprised by some really clever plot twists and turns. Anyways, yesterday’s session was also the first time I’ve ever played the 21 System with an actual GM (and not as a GM-less Caper! session), and I also think that worked out pretty well. There were only a couple of times I had to take over narrative control because I had some specific plot points I wanted to touch upon (when a character consulted some old SHIELD contacts to learn the big bad’s secret identity, for example). Otherwise, I felt like the players were able to sandbox and scenery chew to their hearts’ content. I’ve always liked to jokingly say (okay, it is not a joke) that I designed a game system using cards as the randomizer because dice hate me. But the ironic thing during yesterday’s session was that my cards hated me! I perpetually had nothing but twos through fours in my hand, punctuated by the occasional seven or eight. I don’t think I ever had a single face card the entire session! And I *know* I was never graced with an ace… the players gobbled those right up. And an ever-elusive Joker? Ha! Forgetaboutit! Anyways, this dearth of heavy hitting cards essentially led to a total rout, as my hordes of MGH-fuelled favela kids couldn’t touch the PCs. This’ll necessitate tweaking the mook rules a bit, but I’ll need to avoid going too far in the other direction if the worm turns and I ever find myself with a killer hand… because that’s the other thing I hate in games: swingy math. Anyways, at the beginning of the session, each player secretly wrote which color of chip they’d want to claim as a share of XP at the end of the session (each chip being worth 1 XP). Which color they choose to claim should be based on how they envision playing their character during the session— if they’re going to be going on the offensive, they’ll want to claim reds; if they’re going to be helping/healing leader-y types, they’ll want to claim whites. Blues are for those who’ll alter the physical and human terrain of the story by creating temporary props & set pieces, retconning parts of the story, etc. Well, at the end of the session, the box ended up having forty some-odd reds and only like a dozen each of the blues and whites. And once I looked at the slips of paper to see who had claimed what, only one player had claimed red, one player claimed blue, and three players claimed whites. Now, where’s the fault in this mechanic? How much of this chip disparity was caused by my piss-poor hands of cards and never successfully landing an attack on the PCs that they then needed to recover from by spending white chips? How many of the three choices of white had to do with two of those players having never played the game before, so the chip mechanics were entirely new to them? Anyways, maybe its my Caper!-centric ruthlessness, but I can’t help but feel there remains something to this “box office” mechanic. I mean, isn’t a trope of the superhero genre that you reap what you sow? That you get back what you put out into the universe? That with great power comes great responsibility? Like I said, I can’t help but feel there’s some there there, and that with a group of players who’ve played before, who fully understand what the chips do, and are also familiar with each other’s character, their powers, backstory, and what they bring to the table… this mechanic will add an interesting wrinkle to the roleplaying, the storytelling, and will narratively reinforce the chip-cashing that mechanically drives both. Anyways, I’m really looking forward to session three! I’ve already decided its going to be a PvP ‘Danger Room‘ session so I can really see how the combat rules work. Call it sour grapes if you will, but even now— nearly eight(!) 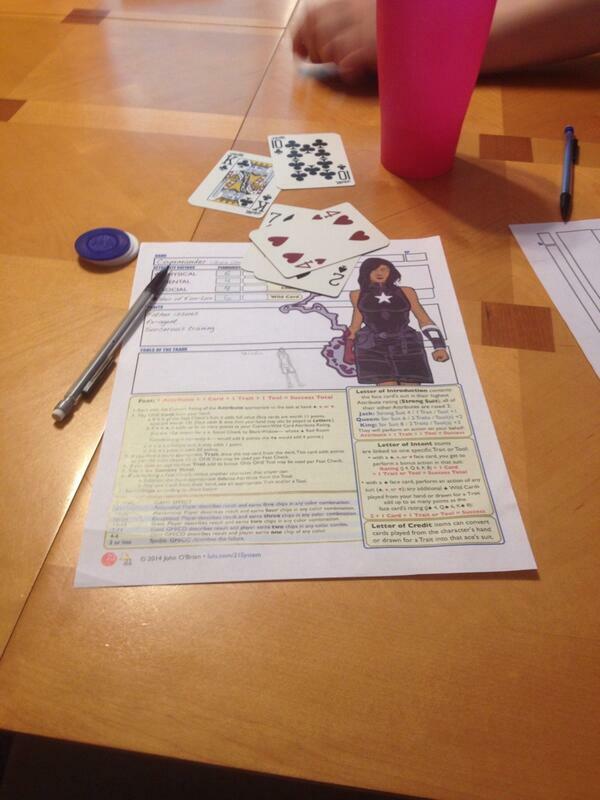 years after I designed Caper!— I still fail to understand the complaint I heard from some critics that they didn’t like the game because it led to backstabbing and ruthlessness since— unlike most (if not all) roleplaying games— it has an actual ‘win condition’. Methinks those folks need to play some Diplomacy. I’ve been busy and haven’t gotten around to writing things up lately, but the Great 13 One Shots Experiment has not died on the vine! We’ve finished off the first chapter (Sorcerer and Sword) and have done character creation for the second (Agon). Due to holidays and grown-up schedules and such it’s slower than I’d hoped, but so it goes. Tonight was the first session of the “campaign” I discussed in my last post. It’s a series of 13 one-shots, building up the world for an eventual 13th Age campaign. Possibly the most ambitious gaming endeavor I’ve ever been a part of. A word about why I’m reading Dungeon World. I had an idea that I proposed to my local group (the same bunch from my 4e/13th Age campaign) – we would do a series of one-shots of systems we’ve wanted to try out for a while, rotating who GMs, using those to build a world history for an eventual main campaign. Kind of a longer-running variant of a lexicon game. I have a handful of systems I want to try out for this. Dungeon World, Burning Wheel/Torchbearer, Sorcerer & Sword, and of course my beloved Rolemaster (or a d20-ish mashup of it that may be more palatable to the group). Others have thrown in 3.5 or Pathfinder, Sons of Liberty, Falkenstein, Agon, old school BECMI D&D, and who knows what else is to come. The eventual goal is a 13th Age campaign with a fleshed out history, with legends epics of the past and different Icons for each age, all fleshed out by the group. We may well end up with a very different picture than the established Icons and “modern” setting of the 13th Age core book (the presence of Sons of Liberty and Falkenstein in the lineup suggests rather more steam-power than canonical) . We may well have a one-shot for each Age (I’m planning on kicking things off with a 0th Age Sorcerer & Sword session around the fall of the Wizard King). And if we do one game a month (one session for character creation and basic grasp of the rules, one for play) we may well be looking at a full year. It’s exciting, challenging, ambitious, and likely to end in calamity. We’ll see where it goes. A quiet day with tacos, hot wings, the Shaw Bros. and a pile of rpgs to read. Pretty perfect. On the last note, I’m currently reading Dungeon World and I think I’m missing what makes people fall in love with the game. The Moves seem to be regular D&D-esque class abilities, the triggers are just explicit statements of how the abilities are to be used, the DM moves seem like basic techniques. Maybe once again I’ve been blessed with outstanding gaming groups where this kind of play is the norm and not completely revolutionary. I can’t even imagine what most groups must be like if that’s the case. I do like the resolution mechanic of 10+ being a success and 7-9 partial. That bit I may want to steal. And the Bonds that connect the PCs together. Fronts seem like a good way to organize and do larger picture prep – I feel like I do a lot of this already but not in a structured way. The directive to “begin and end with the fiction” is a good one, and one I could bear to keep in mind more often. So there are very nice bits in here without question. If you’ve read or played Dungeon World or any of the other Apocalypse World hacks, what makes it sing for you? Have many of you gotten involved in crowd funding games on sites such as KickStarter or Indiegogo? I’ve been late to the game, I think. I’ve only recently started looking at this (last 6 month or so), but I see that more and more small press and indie games are being funded this way. From 20th (or 10th, or Xth) anniversary copies of older games, to expansions of more recent games, to variations of the latest indie darling – there is a variety of things being put up for crowd funding. Given the contraction and consolidation of the game market through the latest recession it seems more and more individuals and companies are using sites such as Kickstarter to not only judge the interest in their product, and fund it, but also to solicit feedback and playtest comments that are then incorporated into the final product. So, it appears the bloom may be fading from 4e. If you read my bio on this site, you’ll see why I’m not terribly broken up by these rumblings coming from amongst my various gaming groups. While Dungeons & Dragons will always be my first love and entre into gaming– and to this day many of my favorite settings, tropes, and themes are to be found amongst that cargo cult (Forgotten Realms, Spelljammer, Planescape, Birthright)– I fell off the wagon during the 3e years, totally ignored the 3.5 years, and reluctantly came back recently to play 4e because, well, it literally became one of the only games in town… If I wanted to continue to game with and hang out with folks whose company I enjoyed, I had to take the bitter medicine. And honestly, as a player, there were some things I did come to enjoy about 4e. Man, can you play the ultimate sneak thief sniper from hell in that game! But as an erstwhile DM, I was frankly horrified by the amount of labor that seemed to be involved in prep, and then the herculean task during the game session of keeping tabs on all the moving parts and widgets for not only all your NPCs but also trying to ::ahem:: help keep the PCs honest. Maybe nothing will ever come of this, but never being one to shirk from any consideration of rules toolboxes and tinkering with fiddly bits, I began thinking about it. One of the first games that came to mind was Lady Blackbird, an indie steampunk skyship game that crossed my desk a year or two ago. I honestly only skimmed it at the time, but it stuck with because the graphic design is gorgeous. I hit Story Games for the first time in many months yesterday, and saw some of the great things people have done with those rules in the meantime, and was duly impressed and intrigued. Could one truly step down from the precipice of 4e rules bloat, play ersatz D&D in a rules light indie game, and at the same time breathe new life into all those bookshelves worth of sourcebooks by recycling their simulationist widgets as narrativist ‘tags’ and ‘aspects’? It seems so! However, the one thing that gave me pause was Lady Blackbird’s seemingly baked-in conceit of GM pre-generated characters. I don’t know if that’s a relic of the game being a convention one shot or something… or perhaps because of some narrativist need for touchy/feely inter-party story hooks… but it strikes me as incredibly odd that in their quest to liberate the grognards from the shackles of DM railroading and ‘bad’ “I kill and loot the body” storytelling by introducing player narrative control, that they’d shackle those same players to being unable to roll up and create the character they want to play and evolve through said enlightened storytelling. So anyways, if you are still bearing with me, let me share with you some ideas I’ve come up with for addressing this gross oversight and crime against not only the hobby, but affront that cuts to the very core of what makes us human. Taking a page from Spirit of the Century, I can envision the first session of a prospective campaign being one in which the DM pitches the overarching plot he’s got in mind (“in this game, you’ll be pirates in arcane space,” “in this game, you will be agents for a decadent and increasingly paranoid King”) and the players then make up their characters and build hooks to each other by writing up some of their prior off-screen adventures together; basically replacing SotC‘s pulp novel conceit with D&D‘s adventure module one. Each player names 4 Traits for their character. These Traits can be pretty much any tried and true D&D trope like race, character class, prime requisite ability score, class feature, skill, AD&D non-weapon proficiency, 3e feat, signature weapon specialization, magic item, alignment, patron deity, 4e character role, etc. etc. For each of these Traits, name 2 Tags that further build upon and describe what that Trait means and does. They will write up a few sentences describing a pivotal scene their character had during this adventure. Based on this scene, they will come up with 4 more Tags that further flesh out their developing Traits and character advancement. These can be four Tags under one Trait, one Tag under each of the four Traits, or any combination thereof. Once everyone has done this, they should pass their adventure page to the player to their right. Now, they will write a scene their character performed as a member of the party in this other adventure. Based on what they describe, they will come up with a further 3 Tags for their character, again under any combination of Traits. Coming up with Keys. Keys are the motivations, problems, connections, duties, and loyalties that pull on your character. Each character will have three Keys. Each player should read aloud the final write-up for their adventure module. Based on what transpired in the story (and rather than choosing from pre-fabbed laundry lists of Keys which I honestly don’t have the time or desire to do right now) the players should discuss and brainstorm and come up with some ideas. Again: character classes, origin and background feats, alignments, prestige classes, magic items and relics, Forgotten Realm secret societies and Planescape Factions… they can all provide possible fodder for Keys. From the crowd sourced list that arises from their module, the player will pick one Key for their character and one Key for the character of the player to their left– the last person to add to their adventure module (and the one who ostensibly wrote the exciting climax). Once everyone has two Keys (one they picked themselves, one given them by the player to their right), the DM will assign each character their third and final Key. This can be something left over from the brainstorming session lists, something new that they want to see explored by the player during the campaign, etc. * You can re-roll a failure once per session, or give someone else in the party this benefit. * You have a power or ability that automatically accomplishes something storywise, and you get to narrate the scene of this success. It all seems fairly straightforward, but never having actually *played* Lady Blackbird, I can’t quite be 100% sure that it is this simple. I think I may want to try and use this rules hack to run that Planescape police procedural I’ve always wanted to do (Law and Order: Sigil?!? ), so if I can ever make that happen, I’ll let you know.